Abstract: This thesis examines some projects of moral regulation, implemented by the agents of the church and king in the late Anglo-Saxon period, which sought to modify and govern marital conduct. Theories of moral regulation are analysed in the Introduction, which also examines Germanic marriage practices, as far as they can be recovered, and the Anglo-Saxon church’s inherited attitudes towards marriage. Manuscripts and texts are examined firstly as projects of moral regulation, and secondly as projects which attempted to alter marital behaviour. In Chapter 1, moral regulation is situated within the context of the Benedictine reform through the examination of one manuscript – Cambridge, Corpus Christi College, MS 201 – as a case-study in the cooperative efforts of the church and king to regulate society. In particular, the legislative and penitential texts which are compiled in MS 201 bear witness to the tendency in late Anglo-Saxon England for legislation to be moralised, and for morality to be legislated. 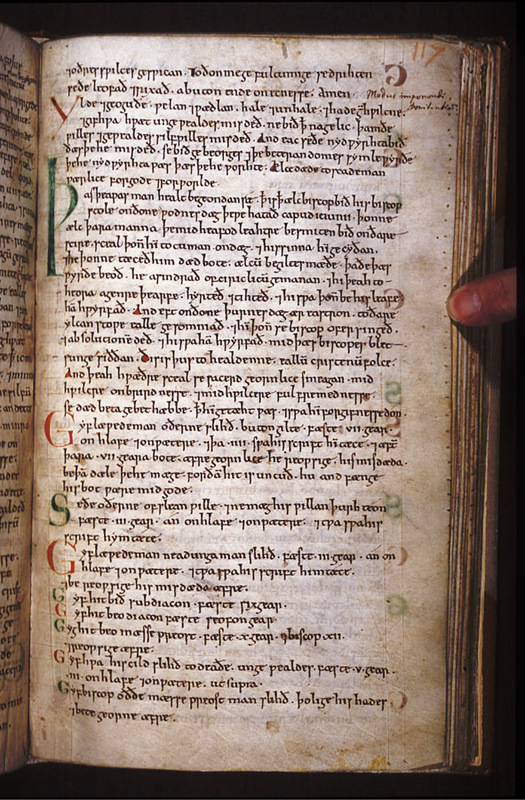 MS 201 also includes the unique copy of the Old English translation of Apollonius of Tyre, and the marital morality inscribed therein perhaps accounts for its inclusion in this predominantly Wulfstanian manuscript. In Chapter 2 the riddles recorded in the Exeter Book are interpreted as literary exercises in regulation. This chapter establishes the possible moral and regulatory agenda of the Exeter Book riddles by offering a new interpretation of, and solution to, one riddle. It also analyses the marriages made manifest in some of the so-called ‘double entendre’ riddles, which regulate the moral relationship following Pauline exegesis: emphasis in these riddles is on the sanctity of marriage, wifely obedience, and the payment of the conjugal debt. Conversely, Ælfric, in his Lives of Saints, idealises marriage as characterised by the absence of all sexual relations. In his Life of St Agnes (examined in Chapter 3), and in his Lives of married saints (SS Julian and Basilissa, SS Cecilia and Valerian, and SS Chrysanthus and Daria, examined in Chapter 4), Ælfric makes non-sexual, companionable, and loving marriage morally paradigmatic. Whilst both marriage and morality have been studied by modern critics, neither topic has inspired extended, specific study (with a few, notable, exceptions), and the nexus between these two topics has been hitherto unacknowledged. Although new, and often profound, insight is gained into Anglo-Saxon texts by considering them in the context of moral regulation, the morality they propose, as well as the regulatory process used to impose that morality, varies across context, text, genre, and author. This conclusion is also true for marital morality, Anglo-Saxon perceptions of which differed in each of the texts chosen for evaluation. This thesis does not claim to be comprehensive; nor does it attempt to synthesise attitudes towards marriage and morality, since a synthesis does not do justice to the richness or complexity with which this topic was treated. It is hoped that this thesis will provide insight into not only individual Anglo-Saxon attitudes towards marriage but also processes of regulation and social control, and, indeed, into the intersection between attitudes and processes.